Slowly but surely, I'm trying to cover all of the core repertoire of the one-step. The little jump-kick flourish that Vernon and Irene often dropped into their one-step is not really a critical or even common part of the dance. I'm not even sure anyone else ever danced it. But it's fun and distinctive and worth doing regardless. It's also dead easy! I've never found an actual written description of this flourish, or even a name for it; "jump-kick" is just what I call it. But it's quite visible in the surviving film of the Castles dancing in The Whirl of Life (1915). There are also two reasonably reliable later sources: newsreel footage of Irene Castle dancing with a different partner (Vernon having died in 1918) at the 1939 World's Fair, and Fred Astaire and Ginger Rogers dancing in their Castle biopic, The Story of Vernon and Irene Castle (1939), for which Irene served as an advisor. A variation for the one-step that is more often seen nowadays in the tango appears in period sources under a few different names: in the second edition of the compilation Dance Mad (St. Louis, 1914), it turns up as the "Castle Turn (Arabesque Turn)", while Troy and Margaret Kinney, in Social Dancing of To-day (New York, 1914) termed it the "Murray Anderson Turn". Both names were flattering references to noted dancers. The Castles, of course, were Vernon and Irene, the internationally famous dance couple. John Murray Anderson, who posed for the photos in the Kinneys' book, was a dancer and dance teacher, and eventually an impresario who started the Greenwich Village Follies, which in 1923 featured a young Martha Graham. I don't think either Anderson or the Castles invented the move; it's stolen directly from Argentine tango. So I'll just leave it at "arabesque turn". One of the things I do on long bus trips is watch videos, and one of the videos I've been watching recently is clips of the famous 1910s dance couple Vernon and Irene Castle dancing in their quasi-autobiographical 1915 silent film, The Whirl of Life. The Castles can be maddeningly unclear writers, but they were unquestionably superb dancers, and their book, Modern Dancing (1914), is not the sort of random compilation of other people's steps that you see in other works of this era. So I assume that anything that they thought to put in it must be something they considered important, and, when I have time, I try to match up step descriptions with their actual performance to see how what they wrote comports with what they did on the dance floor. The man steps out to the right side of the lady with his right foot. He then steps to side with his left, draws the right up to it, completing the Draw to the left. The Draw Step is danced in front of the lady. To do this the man steps to his side, one count -- that is, when he crosses his foot over his left. Now he brings the lady directly in front of him, continuing the step in that position the three remaining counts. This step can be combined very easily with any of the other steps, as it is simply a walk. The lady starts backward by crossing the left foot in back of the right. She steps out to the right side with the right, draws the left up to it, completing the Draw Step. I did mention that the Castles were not the clearest writers. Following up on my description of Elsie Janis' two little tapping variations from 1913, here's a pair of similar moves from the second edition of Dance Mad, a compilation of dance steps and sequences collected by F. Leslie Clendenen from dancing masters around the United States and published in St. Louis in 1914. The first is simply called "The Tap" and is a form of hesitation like Janis' three-steps-and-a-tap sequence. Happily, it does not travel against the line of dance, which makes it a considerably more socially friendly move. The sequence is very simple. The dancers start in closed position, the gentleman moving forward and the lady backward along the line of dance. The gentleman's steps are given below; the lady dances on the opposite foot. I'm on the road again this week, hauling my still-jet-lagged self to the library to do research as well as DJing in the evenings, so it's a good week for easy one-step variations! These two are taken from an article by Elsie Janis published in the Chicago Daily Tribune on November 23, 1913. Janis (1889-1956) was a vaudeville actress who moved to the stage and later to film, as well as a poet, songwriter, composer, and producer. Ohio State University has a nice online exhibition on Janis with a biography and related ephemera. While we tend to think of 1914 as the significant year for the new dances of the ragtime era, since that's when a cluster of major books on the topic came out and the foxtrot made a splash, several of the major dances of the 1910s became popular slightly earlier. Janis wrote about some of them in a series of breezy newspaper articles in late 1913. Dances covered included the one-step, Castle walk, hesitation waltz, and tango. This particular article is misleadingly titled "It's Not What You DO -- It's What You DON'T In The One-Step Variations". What you don't do, in brief, is move your body in various ways that were considered vulgar. But Janis' heart wasn't really in this topic. After one short paragraph, she went on to devote three columns (plus illustrations) to what you do do, meaning variations. Here are a pair of easy ones that can be generically described as "one-two-three-something". I sometimes wonder what it is about Yale that gets its name attached to dance positions as well as dances. At left is the Yale position of the 1910s, as illustrated in Albert W. Newman's Dances of To-Day (Philadelphia, 1914). Click to enlarge the image. The dancers stand right side to right side, feet not interlaced at all. It's a perfectly reasonable position for traveling or hesitating in the one-step and a necessity for starting off moves like the Pomander Walk or the various hop-turns in the foxtrot. Newman also calls this the American position, so I suppose there are some pleasing associations there: Yale, all-American college boys, rah rah, Boola Boola, etc. I used to make jokes about this position being a reflection of Yale students' dating life (looking right past each other...), but earlier in the century Yale's reputation seems to have been rather the opposite. Concluding my extended celebration of the foxtrot's centennial year: more about the hop-turn! A few years ago, I considered hopping in the 1910s foxtrot to be a relatively obscure practice -- I'd only ever found one sequence with a hop in it and had only a brief mention in a newspaper article to reassure me that it was not just a one-couple oddity. But looking through Edna Stuart Lee's Thirty Fox Trot Steps (New York, 1916), there are actually several sequences that include hops, including two that are strikingly similar to the previously described Bassett/Elliott hop-turn. Here are two more ways to, in the words of the newspaper article, "make our turn with a quick, fast hop" while foxtrotting. Vernon and Irene Castle's Reverse Dip Step shows up as a one-step variation in two little commercial publications that feature the Castles: Victor Records for Dancing (1916?) and Three Modern Dances (1914), also published by Victor. The Reverse Dip is a simple little hesitation sequence. The recontruction is made particularly easy because the Castle were kind enough to include in Three Modern Dances a filmstrip sequence of themselves performing the moves. I've included a scan of it at left; click to enlarge. The original is only about 8" x 2.5", so the image quality when enlarged is not going to be great. To follow the sequence, start at top left and go down the left-hand column, then down the right-hand one. Note the product-placement victorla in the background; Three Modern Dances includes ads for eight different victrolas as well as for records. At the end, simply rise to start off on the left foot again and repeat or move on to return to a basic one-step or other variation. The dip is not a simple rock backward; the dancers keep an upright posture and bend their knees, as can be seen clearly in the slide "D". The Reverse Dip breaks down on the filmstrip as three walks (A to B), rock and three more walks (B to C), dip (D), and repeat starting with the three walking steps (D to E). Though the film shows a turn, that is a function of trying to keep the performance in camera range, not an actual part of the move. Note that this is what I call an anti-social variation: it not only hesitates, it goes directly against line of dance and thus creates a significant danger of a collision with other dancers. So it's a poor choice for a crowded room, but a nice move to do on a big floor with few couples dancing, or in the center of the room, a corner, or some other out-of-the-way location. In 1914, Victor Records made a celebrity-endorsement deal with Vernon and Irene Castle, "the greatest exponents of Modern Dancing who supervise the making of Victor Dance Records". The company put out a little booklet, Victor Records for Dancing, which included short instructions for various couple dances (including the brand-new foxtrot) plus an enthusiastic note from Vernon Castle about the superiority of Victor records and the indispensibility of the Victrola in teaching classes. The instructions for each dance were accompanied by a convenient list of suitable Victor recordings. Tucked at the end of the book were instructions for a country dance and a Paul Jones circle mixer "as taught at the Castle School of Dancing, New York City". In the past, I've discussed a very simple 1903 two-step circle mixer and a more complex English Paul Jones from the 1920s. The Castles' version is quite similar to the 1903 one, but it's physically rather livelier while mentally less taxing; the dancers don't have to count. Re-form the circle and repeat all of the above until the music ends. The Castles helpfully confirm that "As the time for changing is optional, the signal, which is usually the blowing of a whistle, is left to the discretion of the director of the dance." The printed instructions mistakenly list "grand right and left changing to counts of 8 measures", which I believe was more likely intended to be "counts of 8", or four counts per change of hands, which is a typical pace for a grand right and left. It has to be some sort of error, since there is no exact duration for this figure; it goes until the signal is given. The circles are described as "all slide to right chassé" and "Repeat to left chassé"; in practice, this is a "sixteen-slide galop" in each direction. That's a lot of slipping, so it wouldn't bother me particularly if it were cut to four measures each direction in practice. The slipping is a little tricky to manage when coming back together after dancing with a partner; any laggard dancers cannot easily join in without getting mowed down. A signal by the director of the dance to tell the dancers when to start slipping is probably going to be required. Making sure to signal to reform the circle with at least two measures' lead-time before the end of a phrase will help let the dancers get into position ready to start with the musical phrase. Four might be safer. The slipping circle starting to the right is weirdly reminiscent of the opening "grand round" change of an 18th-century French cotillion, though in no other respect does this dance resemble "Le Paul Jones", an unexceptional cotillion from the 1770s with no mixer element. For music, dancer were referred to the lengthy list of "Victor Records for the One Step", but the Castles also noted that "The One-Step is generally used for the Paul Jones...but the Fox-trot, Canter or old-fashioned Waltz may be used." In practice, an "old-fashioned waltz" would presumably require canter (1...3) rhyhm in the slipping circles, which would make for a much gentler dance. It being the year for 1914 centennial balls, a Paul Jones is something to consider for a ball program, especially early in the evening, in order to break down social barriers and allow strangers to meet. Rounding out my little miniseries celebrating the centennial of the first burst of popularity for the foxtrot, here's another pair of variations from Edna Stuart Lee's Thirty Fox Trot Steps (New York, 1916) that each feature a moment when one foot crosses over the other. The lady dances opposite, as usual, with one major exception. Whether she crosss behind or in front on the cross step is not specified by Lee, but experimentation with both options leads me to believe that a front cross, mirroring the gentleman, is the most likely. While leading her into a back cross is certainly possible, and not particularly difficult in the context of this variation, it makes a full back step after the cross less natural; the tendency is to just close the feet instead. Having both partners cross in front works more smoothly and provides a nice contrast to the following two-step. The Side Swing is entirely leadable for good dancers, even if the follower has never previously tried it. Once again the lady dances opposite except on the cross step, where she also crosses in front. The final quick-quick-slow moves perpendicular to the line of dance, the couple stepping first toward the center of the room and then toward the wall, closing the free foot without weight. To lead the "without weight" part, the gentleman should simply keep his weight firmly on the right foot, or even sway just slightly toward the right. A good follower will pick this up without ever having danced the sequence before. The final side-side-close (effectively a hesitation, since the dancers make no forward progress for two beats) feels vaguely similar to the box step, which is a legitimate move for 1910s foxtrot. But I would not recommend teaching the Chaplin Trot in combination with the box step to newer dancers. The close without weight in this sequence will sow confusion, since in the box step dancers close with weight during the final side-close. Lee described the step as a good one for "young couples desiring plenty of action and a touch of the spectacular" -- evidently her threshhold for spectacle was somewhat lower than mine -- and notes, accurately, that it is "an excellent ground gainer". Special thanks to Irene for dance-testing the foxtrot variations for this miniseries! Most of the steps in Dance Mad (St. Louis, 1914) were collected by "author" F. Leslie Clendenen from other dancing masters, but he gives himself credit for the Sorority Glide, a sixteen-bar one-step sequence that he recommends be danced to "Too Much Mustard" or "any One Step music of a similar swing. It's a fun little sequence with a very "Castles" feel to it and room for some personal style. It works as an independent dance or can be plugged into a regular one-step as a variation. The dancers begin in a ballroom hold, turned out slightly so both face line of dance. The dancers need to be far enough apart to make a cross step without crowding. Weight should be shifted onto the forward (outside) foot, the gentleman's left and the lady's right, since the dance starts on the inside foot. Cross inside foot (his right/her left) over outside foot (1) and use outside foot to make a chassez, closing and pushing the inside foot forward again (&2). Repeat, counting 1&2&3&4&5&6&7&8, ending on a cross of the inside foot. Point outside foot (his left/her right) sideways along line of dance (1), cross it over inside foot (2), point inside foot (his right/her left) sideways against line of dance (3), and close it to the other foot with weight (4). Step sideways along line of dance (1), close (2), step sideways (3), close (4). Gallop one bar (side-close-side-close, 1&2&) then step side (3) and close (4). The half-turn is a slow, three-count two-step turn: side, starting to turn (5); close (6); side, completing turn (7). The dancers are now turned halfway; line of dance is "over elbows". Point the inside foot (his right/her left) along line of dance without weight (8). Repeat the gallop and half-turn over elbows, but at the end, put weight on the pointing foot (his left, her right) to set up for a repeat of the sequence. Despite the name, the Castle Glide is a short one-step sequence which, despite its name, was composed not by Vernon and Irene Castle, but by Philadelphia dancing master Albert W. Newman. It appeared in Newman's 1914 manual Dances of To-Day. Newman called it "quite a jolly dance and easy to execute". The Castle Glide features the galop step I discussed last week in its classic nineteenth-century version of slide-close-slide-close-slide-close-slide, with a half-turn on the final slide, repeated for a full turn overall. Note that there's no hop, either initiating or on the turn! It also includes the spin turn (explained here) in Newman's exit-with-a-dip variation. "Easy to execute" is a bit of an understatement; the Castle Glide is very, very easy and well-suited to beginning dancers. It makes a particularly good practice sequence for galops and spin turns. Its only even slightly weird characteristic is that it is ten bars long, which is not terribly musical. Newman says to repeat it, which makes it a slightly better twenty bars, but it would need a total of four times through to line up nicely on the typical eight-bar musical phrases. If the Castle Glide is being used as a one-step variation rather than a sequence dance and not immediately repeated, one can simply walk out of it with four more steps to at least get onto a four-bar half-phrase. The sequence begins with the dancers in a normal closed ballroom hold, the gentleman moving forward along the line of dance and the lady backward. The gentleman's steps (L=left, R=right) are given below; the lady dances opposite. The spin turn, dip, and walk out should between them make up a full rotation, or close to, if the dancers are to continue along the line of dance. That isn't particularly difficult, but doing the spin turn in a corner of the room will make it even easier. The most important transition in the dance is from the second galop sequence into the spin turn. There is no specific music for this dance; Newman suggested only 2/4 ragtime music a bit slower than the peak one-step tempo of the Castle Walk. It looks like this is going to be another one-step miniseries! Another important, though deceptively simple, variation from the Castles is the "step out." This is commonly done in social ragtime dancing, but rarely named (most dance manuals don't even mention it as a separate movement) and even more rarely really thought through. But the Castles use it constantly in their one-step in The Whirl of Life, and it's the starting movement for variations like the Pomander Walk. It also comes up in the foxtrot as the setup for the hop-turn. So let's talk a little about it. "It is simply stepping out at the side of your partner so that instead of walking in front you are walking a little to the right of each other." "The gentleman is walking forward and the lady backward, as in the ordinary One Step. Now the gentleman holds the lady a little distance away from him and steps out to his left so that, without changing the direction at all, his right foot is at the side of her right foot instead of being between her feet." You then continue one-stepping along in this position for as long as you like. I'll wind up this little mini-series of one-step posts with an easy variation from Vernon and Irene Castle's manual, Modern Dancing, (New York, 1914). The zig zag is very similar to the snake dip described by Philadelphia dancing master Albert Newman (discussed by me here). The oscillation from right Yale position (the two dancers' right sides together) to left Yale position (left sides together), with the lady backing up while the gentleman moves forward, is the same, with the differences found only in the starting foot and the placement of the dip. I have no doubt that these are simply regional variations of the same step, but they do have a slightly different effect when danced. While the snake dip begins with the gentleman stepping to the left (right Yale position) with his left foot, the zig zag begins a beat later. After one walking step forward on the left foot (lady backing on the right), the gentleman crosses his right foot in front of the left to step out to right Yale position, taking three steps in that position (right-left-right) before crossing his left foot in front of the right to shift to left Yale position and take three steps (left-right-left) thus. The lady is dancing opposite, crossing her left foot behind her right to start the move and continuing on the opposite foot from the gentleman, always crossing behind. The zig zag may be continued indefinitely, exited most easily after any trio of left Yale position steps by the gentleman simply not crossing his right foot over, instead stepping straight forward toward the lady and resuming backing her up for as many steps as needed to round out the musical phrase. To make it more effective, the dancers can bend on the first step. That is when the man crosses the right over the left and when he crosses the left over the right. This bend is actually on the same foot as in Newman's snake dip -- he places the dip on the second step of every three-step diagonal, which is effectively a crossing step. There's a perception that doing the 1910s one-step is always a matter of stepping precisely once per beat, no more and no less. As can be seen in the half fade-away, which leaves one foot in the air for a beat, that isn't always strictly true. And while that sort of pause is unusual, the one-step also incorporates skipping steps of various kinds in moves like the polka skip and pony step, as described by the leading dancers of the era, Vernon and Irene Castle, and other dancing masters in dance manuals published in 1914. It's been quite a while since I got back to the plain old 1910s one-step, so here's a quick and easy sequence from Albert Newman's Dances of to-day, published in Philadelphia in 1914. It's an interesting little combination of side steps and natural and reverse half-pivots that I've never seen anywhere else. The most popular "animal dances" of the early 1900s appear to have been the Turkey Trot and Grizzly Bear. But the F. Leslie Clendenen's compilation manual Dance Mad (St. Louis, 1914) offers a pair of one-step variations attributed to London dance teacher Walter Humphrey, who apparently found inspiration in the hopping of Australian marsupials. I've never found these variations in any other source, so it's not clear to me how widespread they ever were. I would also have placed them a bit earlier, maybe 1908-1910, as by 1914 the animal dance fad was already well past and the smoother, more elegant style of Vernon and Irene Castle was making the one-step acceptable in respectable ballrooms. It's possible that Mr. Humphrey and/or English dancers in general had not quite caught up with the latest American dance fads, or that Clendenen was not as fussy in compiling his book as its subtitle, "The Dances of the Day," suggests. For both variations, the dancers both face line of dance. It's not clear whether they should retain joined hands in front or open up fully. I find the latter more graceful, but how much of a priority grace should be while hopping around a ballroom imitating a marsupial is debatable. Those wishing to study wallaby technique in detail may consult this National Geographic video. Steps below are given for the gentleman; the lady dances opposite. In both variations, the dancers need to actually travel forward on the hops rather than just bouncing in place. As William Hamrick noted drily in The Flying Cloud Vintage Dance Handbook, wallabies have a different understanding of rhythm than kangaroos. Although the traveling turn (or "pivot," though in period that can refer to a different turn as well) is enormously popular among modern dancers of the one-step, possibly because of the notoriously lengthy string of pivots done in continuous sequence by Fred Astaire and Ginger Rogers in The Story of Vernon and Irene Castle (1939), it actually does not seem to have been nearly as popular among dancing masters of the 1910s. While the traveling turn occasionally appears in other dances, I have found a written description of its use in the one step only in Albert Newman's Dances of to-day, published in Philadelphia in 1914. Other sources mention "whirls" or "swirls," but exactly what kind of turning these terms refer to is not specified. In order to execute these turns properly it is necessary that the dancers should be most proficient and move perfectly together. Each foot virtually describes a semicircle (cycloid movement) upon the floor, the dancers really stepping around each other. This is quite effective, but requires considerable practice together. Like the Pomander Walk, the Snake Dip is a one-step variation found in Albert Newman's Dances of to-day, published in Philadelphia in 1914, in which the dancers take, alternately, right- and left-side Yale position. In the Snake Dip, however, the dancers make a continuous zigzag pattern along the line of dance rather than alternating travel with making circles in place. Newman somewhat imaginatively suggests of this sequence that "when well done it resembles the movement of the snake." His diagram of the gentleman's steps is at left. 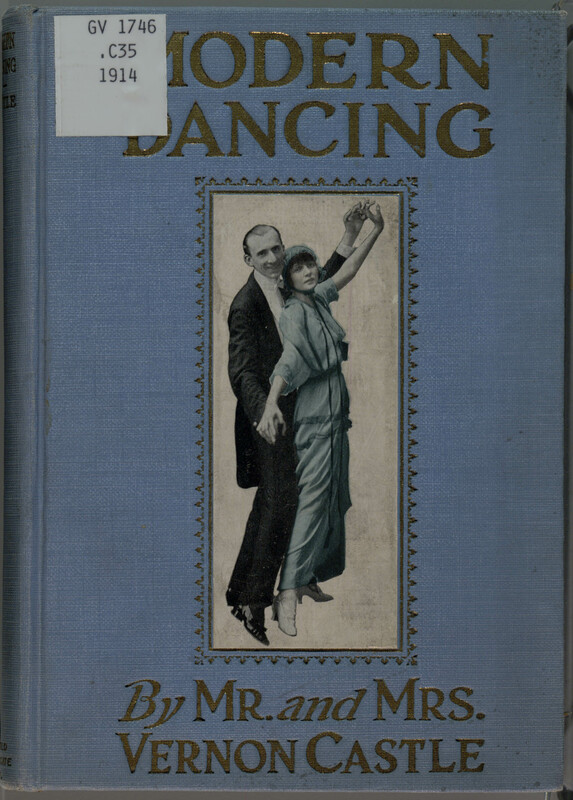 F. Leslie Clendenen's 1914 compilation, Dance Mad, is full of sequences of varying levels of difficulty for many of the popular dances of the 1910s. This one caught my eye as being a short (sixteen beats) and simple introductory one-step suitable for getting beginners dancing quickly and for teaching the lead for rhythm changes between one-step and two-step. Clendenen gives it no special name or attribution, just "One Step." Directions are given for the gentleman; the lady dances opposite. Starting foot is left for the gentleman and right for the lady. Begin in normal ballroom position, with the gentleman facing along the line of dance. The angling to the left and right on the two-steps rather than moving straight forward along the line of dance cues the lady to perform a two-step rather than simply walking. Clendenen describes this as "throwing [the] body slightly to [the] side on the 2 step" and moving "quite freely at left and right of partner." An interesting variation, not given in the source but compatible with period practice, would be to turn clockwise rather than counter-clockwise at the end so that the sequence is then repeated with the gentleman backing up. The mid-sequence turn will then be counter-clockwise. This will not result in full turns, but the dancers could alternate backing the lady and backing the gentleman. From a normal one-step, backing the lady, the dancers step out to Yale position, right side to right side, and walk in a straight line, the lady moving backward and the gentleman forward. At some point, they begin to walk around each other in a circle, both moving forward. Newman's illustration of this is shown at left. The gentleman eventually makes an about-face -- the lady must as well, though Newman neglects to mention this -- leaving the dancers left side to left side, and they again move in a straight line with the lady going backward. They make another circle, both dancers moving forward, followed by a position shift to return to facing each other and backing the lady. ...most practical, especially when one finds himself in a decidedly congested position, surrounded on all sides by merry dancers...it is the same as marking the time of the music, as the dancers execute the movement sur la place (on the spot). Because of this practicality, hesitations are one of the first things I teach new dancers of the one-step. Here are Newman's three hesitations for your dancing pleasure!